Good morning! How are you? How was your week? My week has been great but I am looking forward to the weekend. Tonight we are having friends for dinner so I have a lot to prepare before they get here. My husband is in charge of the meat and I am in charge of everything else. 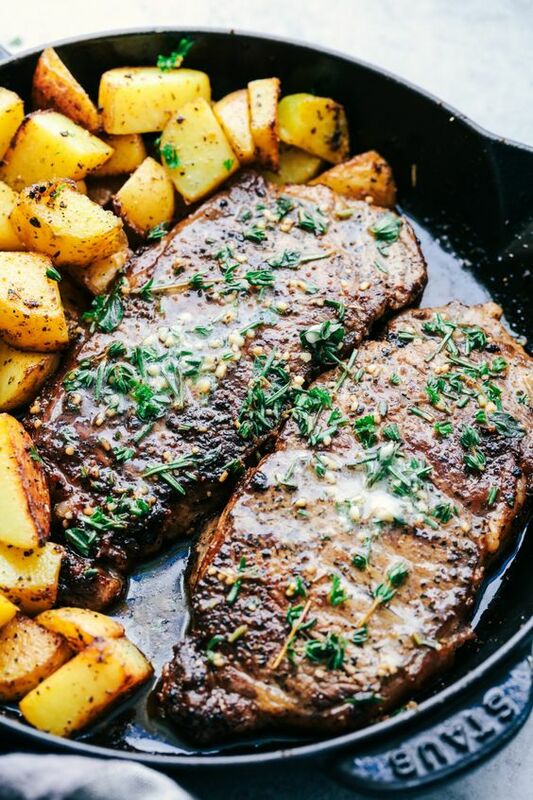 Speaking of meat, this Skillet Garlic Butter Steak and Potatoes from The Recipe Critic is right up my husbands alley. I will have to pass this along to him. 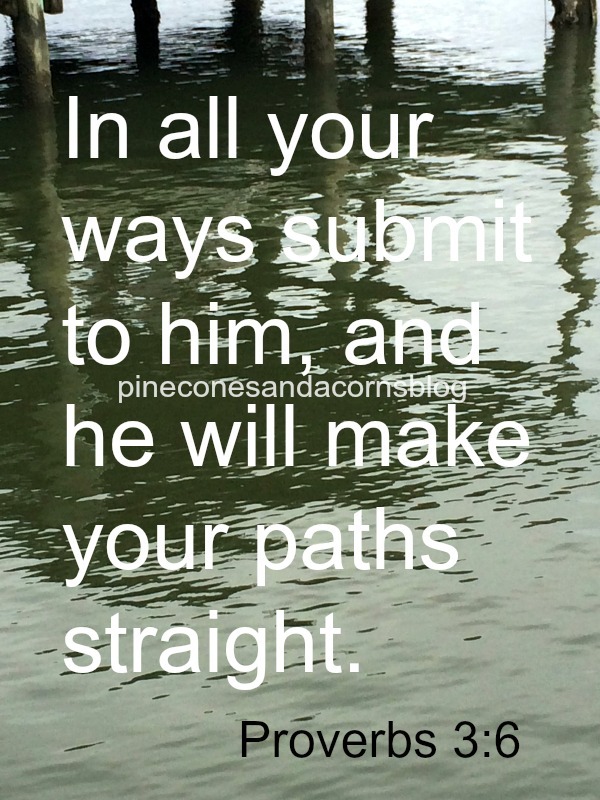 Are you a pimento cheese lover, I am, how about grits? 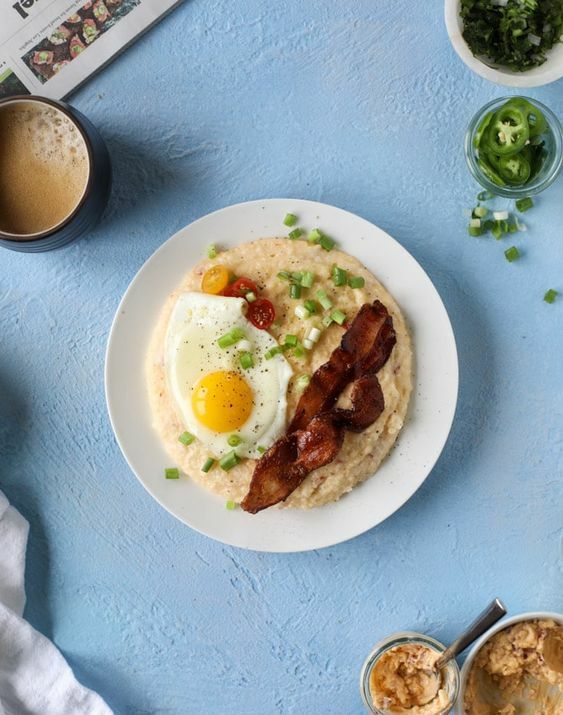 I do not eat them very often but I can't wait to try this recipe for Pimento Cheese Grits from How Sweet Eats. 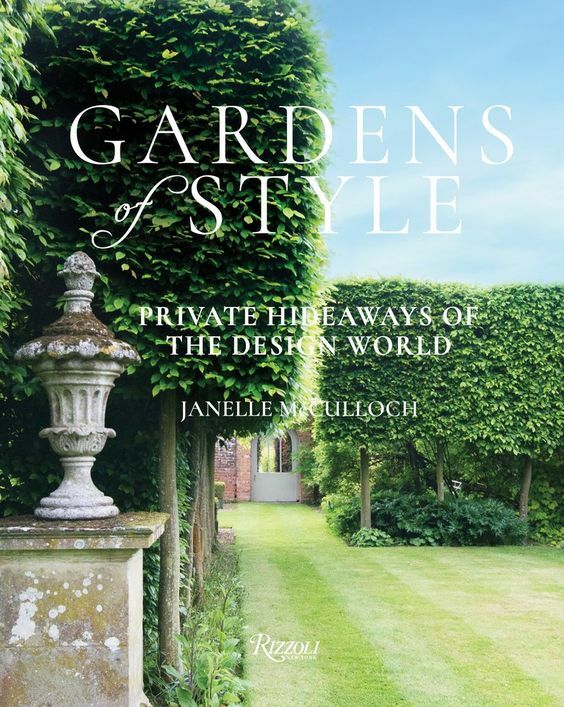 Janelle Mcculloch is one of my favorite authors this month her newest book Gardens of Style was released. I cannot wait to get my copy of this beautiful book filled with stunning gardens, stories and photos. If you would like to see more you can read this article in Architectural Digest. Interesting article, What Would Happen if All The Worlds Coral Reef's Died? I am always looking for a new form of exercise, especially as I age. This is a great review of OrangeTheory, Barry's Boot Camp and SHRED415 Workouts. 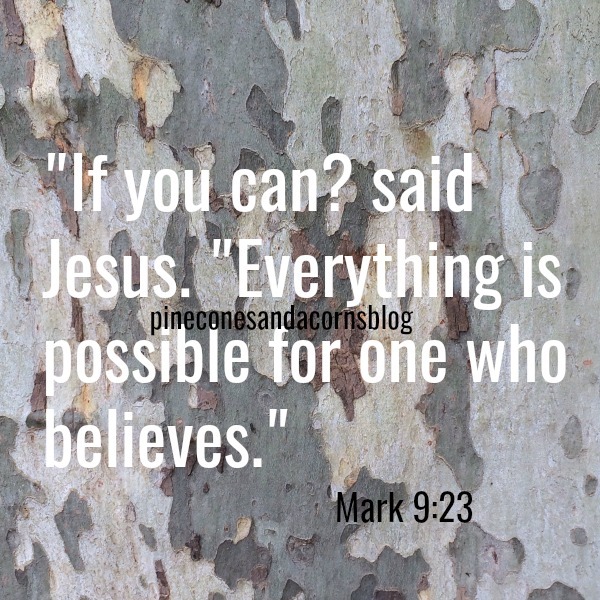 I love this post from Cup of Jo. What did you discover this week? A new recipe, a great movie or book? Whatever it is please share with us! Have a safe and happy weekend. Here are a few more of my favorite garden books this week. Just Curious...What Are Your Thoughts on Social Media? Good morning. I recently read a post from a blog that I have followed for years and she mentioned that she unfollowed, unliked, and deleted blogs, Twitter, Instagram and Facebook accounts that she could not relate to their life or their lifestyle. She said that she was starting to feel badly when she saw outfits, projects, trips, and a lifestyle that did not resemble her own. I have had this same discussion with family, friends, and other bloggers who have written about similar topics. Honestly, I don't feel badly, get sad or jealous about what I see on social media. I have a great life and have been very blessed to travel the world, get an education, live in a nice house, have a wonderful family, etc. 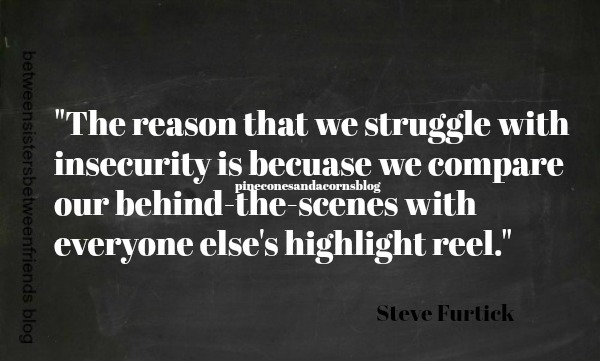 I also know that what we see on Instagram and many other social media sights is a little like "smoke and mirrors. It is typically the best they/me have to offer, the most beautiful and cleanest room in the house(which is why you frequently see it on their feed from every angle), a sponsored outfit, room, patio, a perfect cake, etc. A lot of these successful people work hard to get sponsored work and more power to them but I am pretty sure they would not be decorating a room in their house each season without the heavily discounted or free products, paint, wallpaper, furniture etc. that sponsors offer them. Personally, while I am on social media I like to spend it reading, looking, following, making or doing things that I can relate to, learn from or admire and appreciate. For instance, I do not follow any science fiction authors because I do not read those sort of books but I do follow bakers and cake decorators that make works of art in their kitchen that I will never be able to create. 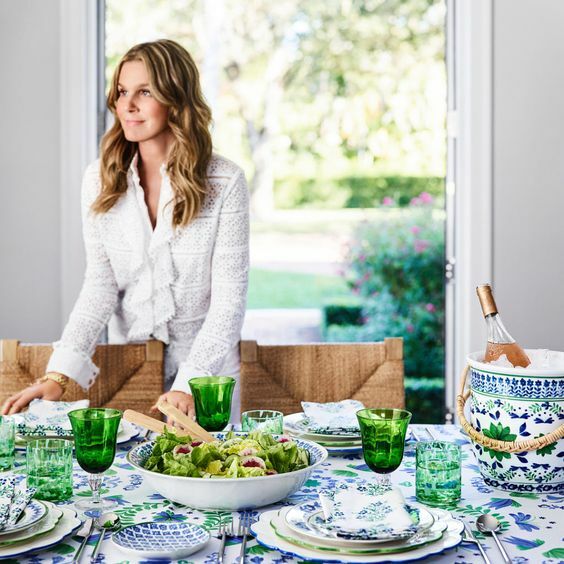 I also follow architects, like Steve Gianetti and his wife Brooke, interior designers, like Robert Couturier, gardeners, like Joseph Valentine of Juniper Hill and photographers, like Jamie Beck because I appreciate the beautiful things that they are creating. Lately, I have found myself deleting blogs and instagram accounts of people that post outfits daily that just do not fit into my lifestyle. I cannot relate to a blogger/instagramer that constantly posts an outfit a day that costs $285 for the shirt, $260 for the jeans, $650 for the espadrilles and another $1500 for the handbag, and that is just the clothing, not including the $275 for the earrings. More often than not these are simple "jeans and t-shirt" posts for a walk to get coffee or lunch with a friend. Really? Don't get me wrong, I love fashion but just not stuff like that. Especially when I know that many of these people either get the pieces free, receive a huge discount, or buy the pieces, wear them and return them(yes its true). I personally love to follow people that have a sense of fashion that is unique to them, like Elizabeth of The Vintage Contessa, Iris Apfel, Ines de la Fressange, Advanced Style and people like that. 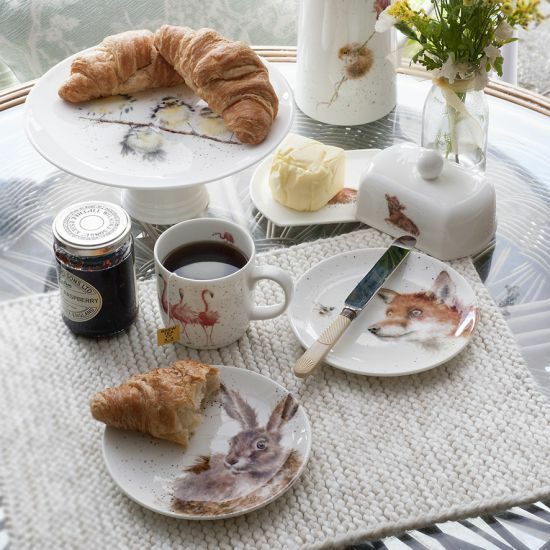 For interiors and travel, I follow House Beautiful, Veranda, Architectural Digest, House & Gardens UK, The English Home, Marie Claire Maison and many more magazines from some of my favorite places to visit, France, the UK, Scotland, to name just a few. I love to see posts of what people are reading, making, baking, or where they are traveling. If they find a great restaurant that serves tacos, margaritas, the best hot chocolate, cake or bread than I want to hear about it so I can put it on my list of places to try when I am in that area. I enjoy people that are "real" and post about their lives, their faith, the ups and downs, their animals, adventures, quotes, food and finds. So tell me, what are your thoughts on social media? Do you love it or hate it? 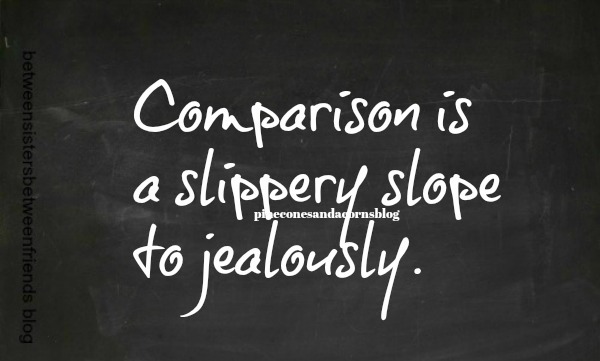 Do you make comparisons between yourself and others? 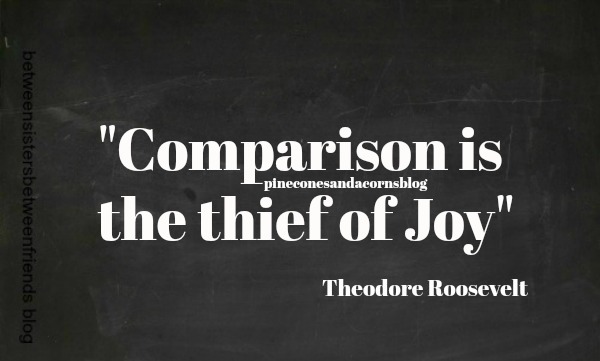 Does it make you feel inferior? Who do you follow and why? What do you like or dislike? Good morning! I hope that you had a great weekend. Ours was beautiful, the weather was beautiful, no humidity, sunny with a slight breeze. The perfect weather for long walks and sitting on the porch in the afternoon sun. 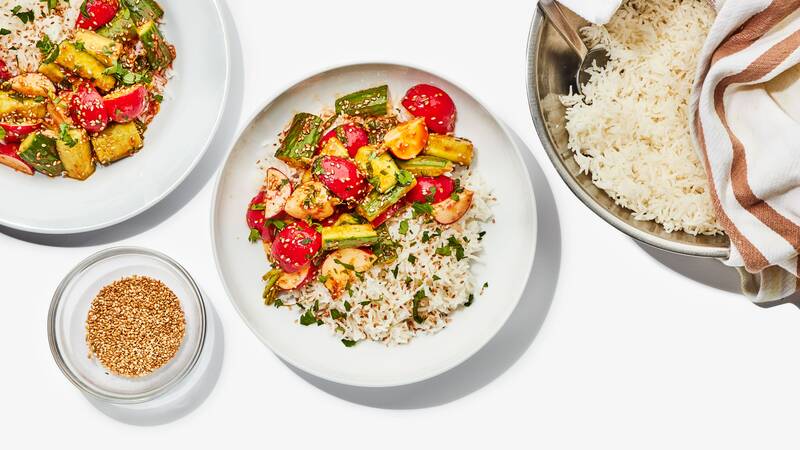 I love finger foods, hors d'oeuvres, appetizers , tapas and foods like that and typically on Friday or Saturday those are the foods that we eat for dinner. A charcuterie board, dips, a cheese board and a salad are really the perfect meal, in my opinion. 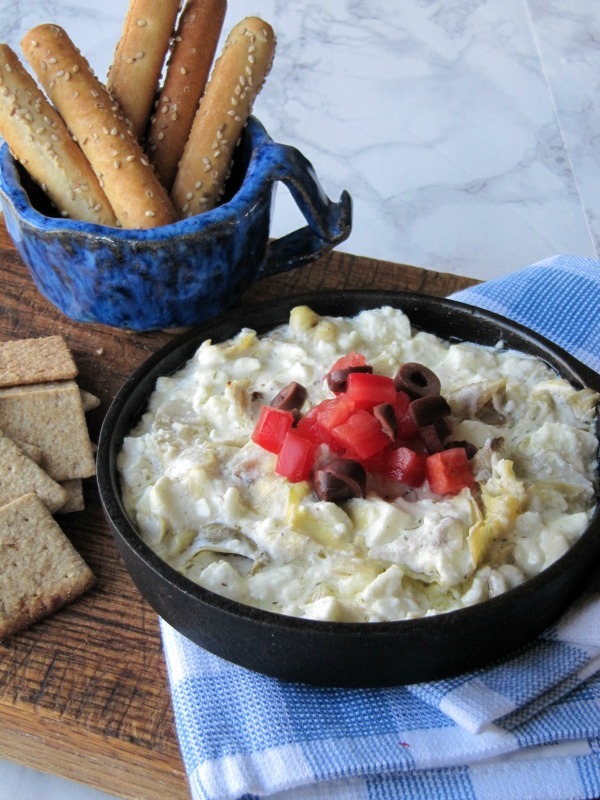 On Saturday I made an easy and delicious roasted artichoke and feta cheese dip to serve with cocktails. 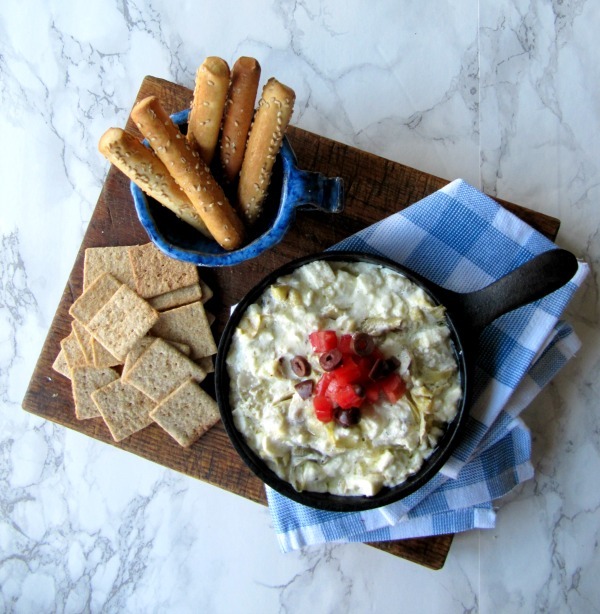 It is similar to everyones favorite spinach and artichoke dip but with the addition of feta cheese and no spinach. I think it is a great addition to your party table, picnic or just a night at home. Preheat oven to 350 F. Add all of the ingredients into a bowl, except the garnish, mix well. 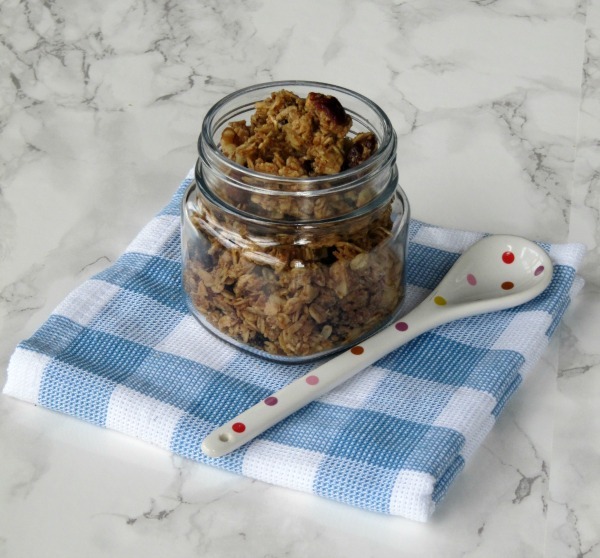 Transfer the mixture to a baking pan that has been prepared with baking spray. 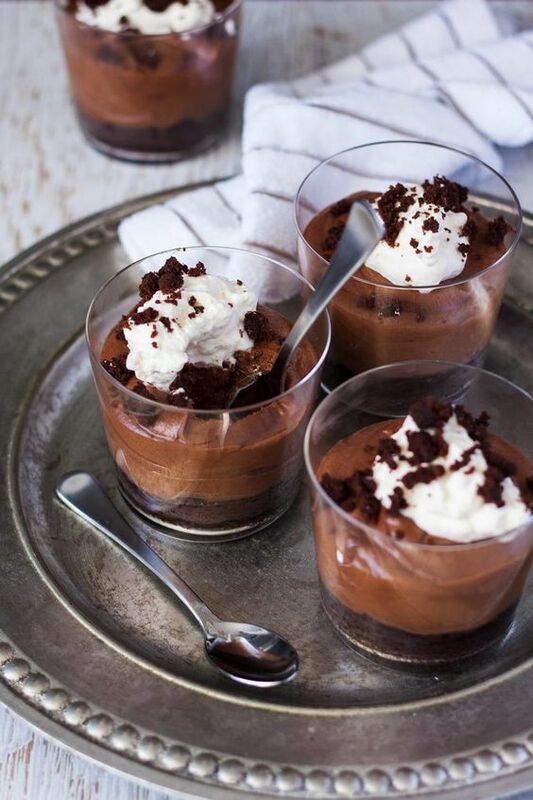 Bake for 20-25 minutes or until bubbly. Remove from oven, garnish with olives and tomato, let cool a bit and serve with crackers, bread or whatever else you like. 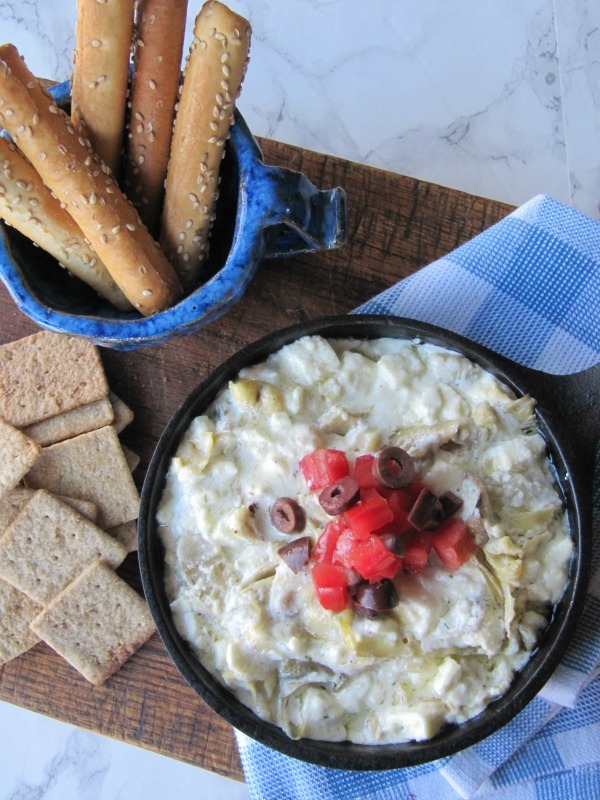 Note: I like to add extra artichokes to mine and sometimes a little extra feta. 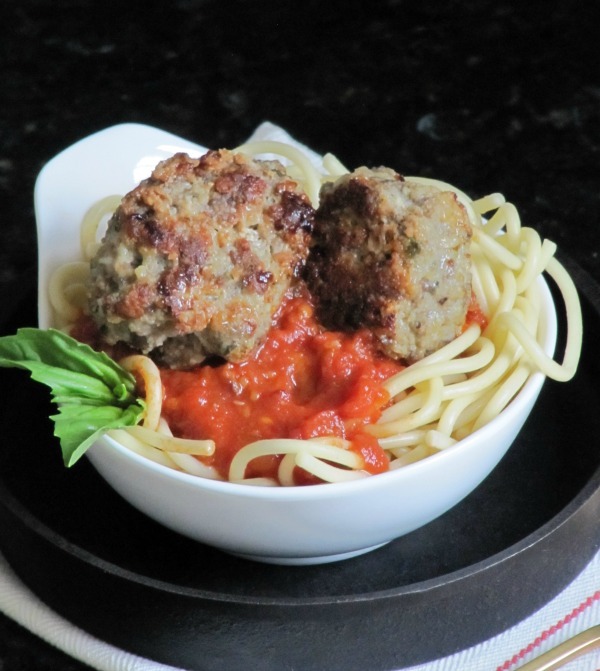 The recipe is simple and you can play with it to make it the way that you like. Good morning! I hope your Saturday has started bright, sunny and warm. Tomorrow is Earth Day and as I mentioned this week we can all do little things to save the planet. We can recycle cans, bottles, plastic, glass, and cardboard. Instead of drinking water bottled in plastic we can use a reusable glass water bottle which is supposed to be better and safer for us. We can forgo the plastic bags at the grocery store and bring our own reusable bags. If you pack a lunch each day you could use reusable lunch bags or use these bento boxes. 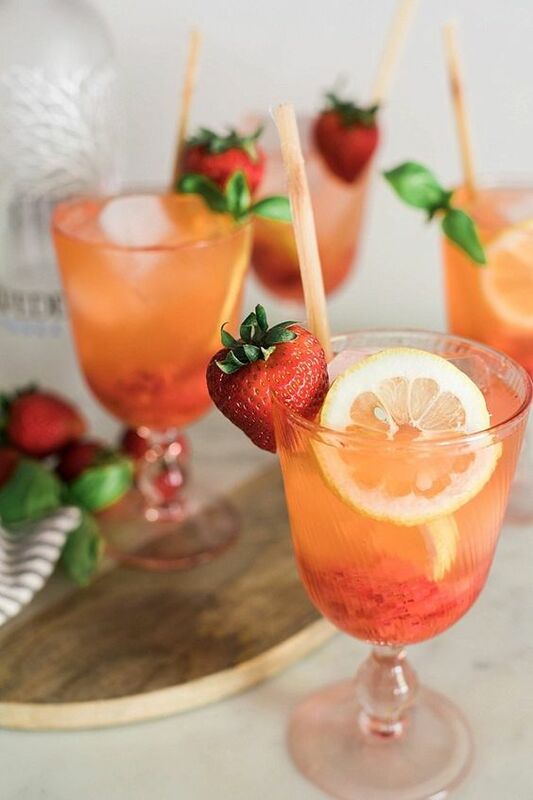 I am all for getting rid of plastic straws and using paper instead not to mention that they add a touch of color and whimsy to whatever drink you are serving. Bring your own coffee cup to your local cafe and have them refill that instead of another cup. In our house we are lucky enough to have a built in recycle bin, which makes it so much easier to remember to separate the trash not only for us but for guests as well. If you do not have a bin that is built in there are many stylish options, like wicker or galvanized metal to match the decor of your house. There are so many little things you can do aside from recycling. You can plant a garden and grow some of your own food. You can buy, drink, and eat local. All of these things believe it or not do help the planet because you are not buying, eating or using items that have been trucked into your town which cuts down on pollution. 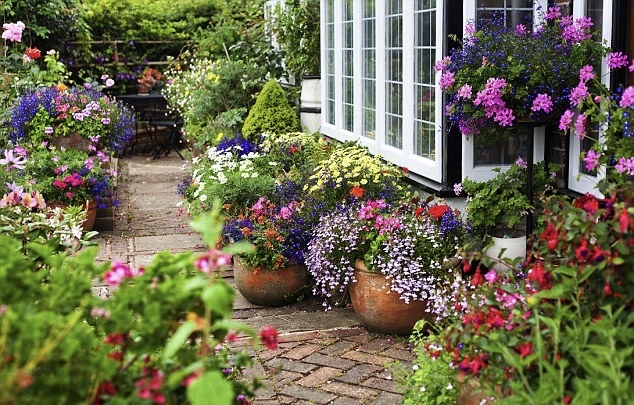 You can also plant some trees and grow some plants and flowers to attract bees to keep the bee population up. Wash your clothes in cold water to save energy and maybe even make some of your own cleaning products. These are just a few things that you can do to help the planet earth. Good morning and a happy Friday to you. Did you have a good week? 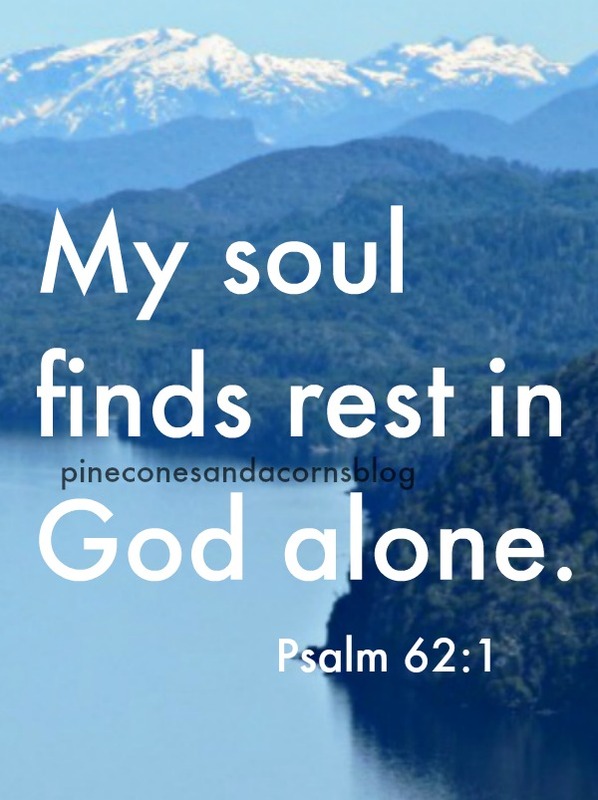 Mine was busy so I am looking forward to a slowing down this weekend. 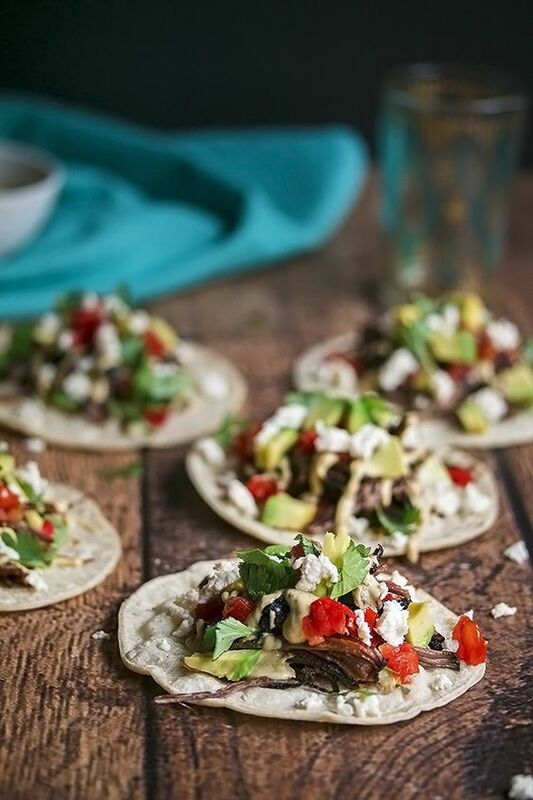 I love tacos, and these Shredded Beef Tacos with Tequila Short Rib tacos from Cooks With Cocktails look delicious. 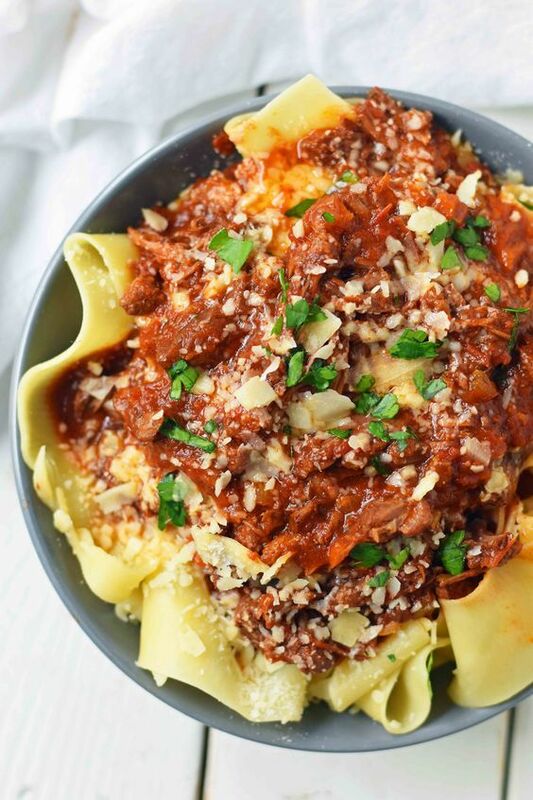 Next to tacos pasta is my other favorite meal, this recipe for Slow Cooker Instant Pot Beef Ragu from Modern Honey will spur me on to use my Instant Pot. 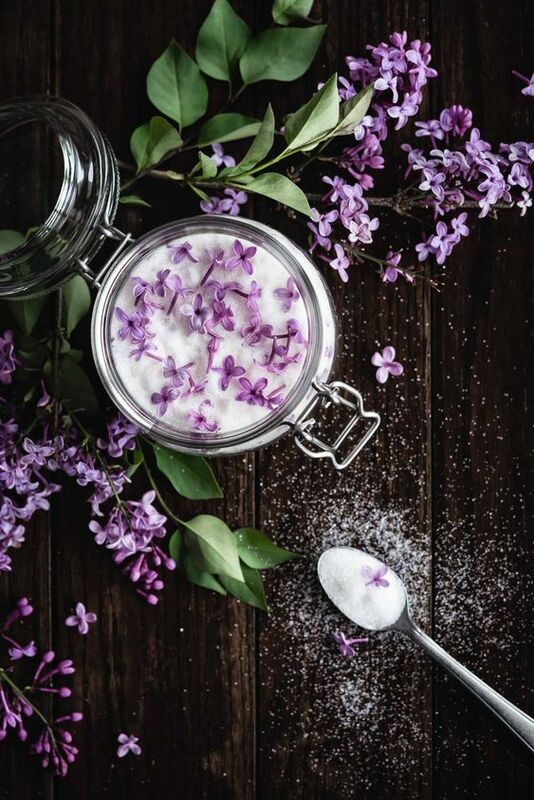 Lilacs are the flowers of Spring and if you are lucky enough to have some in your garden you could make this versatile Lilac Sugar from Ful-Filled. 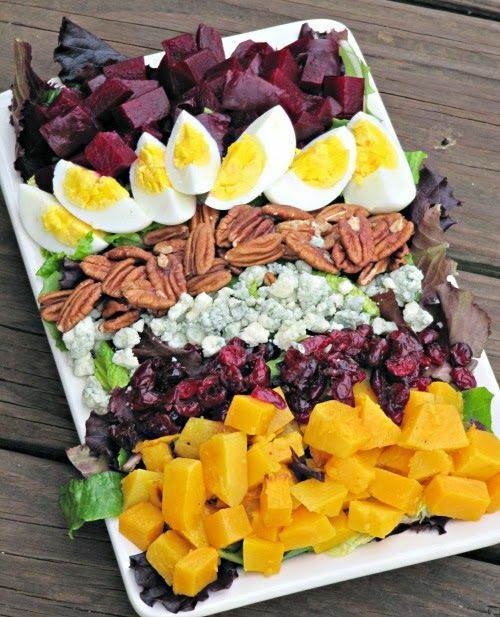 They say the French make the best salads, if you would like to know how to Make a Salad Like the French you might like this article. 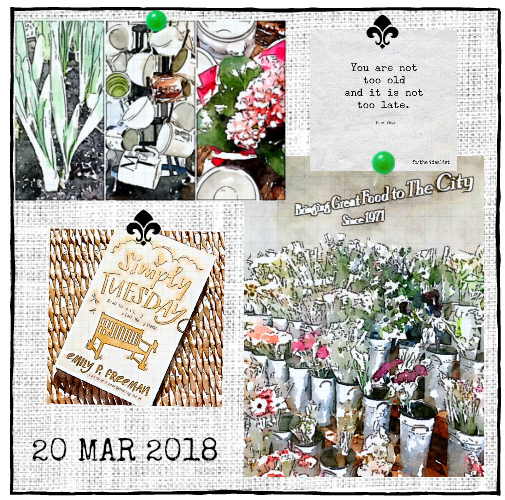 I discovered a new blog this week Tyme to Mango and it is fabulous, the recipes, the writing and the photos are beautiful. 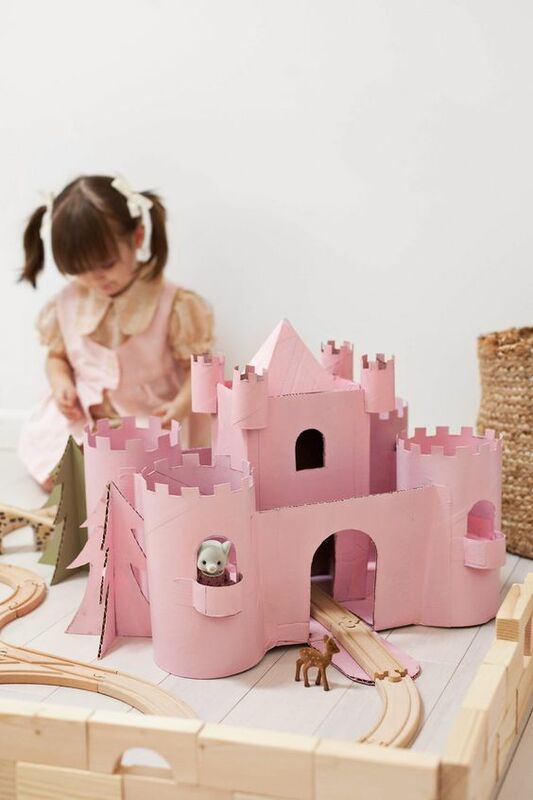 Sunday it Earth Day and in honor of that I thought you might enjoy this adorable, upcycled castle from A Beautiful Mess to make with your children or grandchildren. ( Thanks Taste of France for pointing this post out to me). You have to see these Breathtaking Photos of the Worlds Largest Fresh Water Lake taken by Kristina Makeeva. Have you seen the movie The Jungle with Daniel Radcliffe? I watched it a few weeks ago and thought it was very interesting. You May Be Doing It Wrong, this is an interesting post. 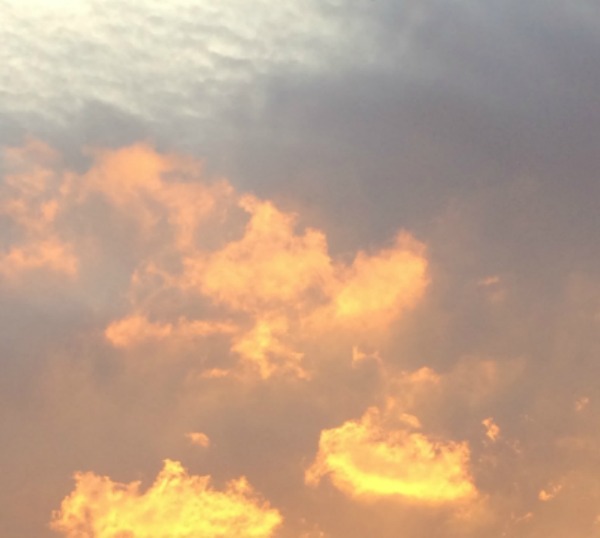 I like this article 31 Five-Second Reminders that Will Make Calmness Your Superpower. Did you read, watch, listen to or make anything interesting this week that we should know about it? If so please share with us. I hope that you have a safe and wonderful weekend. Just Curious...What will You Be Doing for Earth Day? 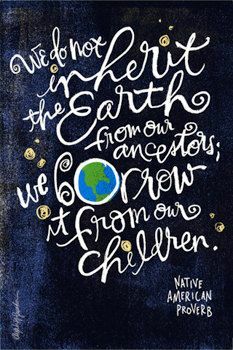 Sunday is Earth day, not the most well know of holidays but surely one of the most important, after all we all live here on earth and we all should not only be taking care of her but enjoying her as well. This year the "theme" of Earth Day is to end plastic pollution. I wrote a post about plastic pollution and its effects on animals, the ocean an the rest of planet Earth a few weeks ago and frankly I was and still am shocked at how much plastic is produced and how destructive it is. Until I wrote that post I really never gave plastic that much thought or thought about the many kinds of plastic that we use on a daily basis that are have such detrimental effects on the planet. Lately, I have been much more conscientious of the plastic in my little world and am trying to eliminate them. 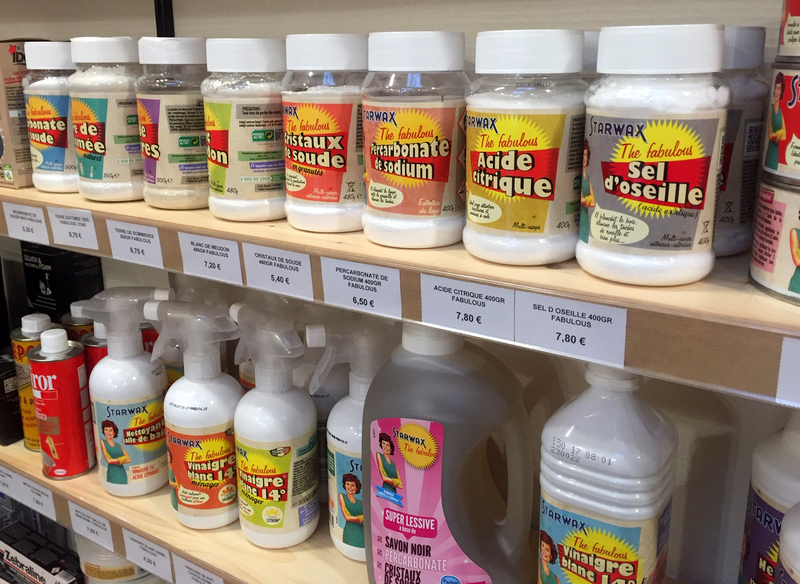 I stopped buying products in plastic, and purchase the same items in glass containers. I never get my groceries in plastic sacks, I even switched my water bottle that I take to yoga each morning to a metal one. These are just a few of the small changes one can make in their life to help rid the world of plastic. In Europe and many countries in South American you cannot get plastic bags at the grocery store, and you must take your bottles to bottle recycling receptacles. Small changes that over the years have hopefully made a difference in the plastic pollution of their countries. If we each make changes and at the same time demand that companies make changes as well perhaps we can reverse some of the damage to the planet. Many innovative products are slowly coming on the market to replace plastic utensils, plates, bowls, cups and even the rings around a six pack of soda/beer and they are all biodegradable and edible as well. And I read this week that some cities are trying to outlaw straws. Change is not going to happen over night but it will if we make it a priority. As with anything I think unless the dangers of straws, plastic bags, bottles and the likes are constantly advertised or marketed people do not realize the damage they are doing to our planet. Do you uses plastic? We you aware of how much damage it does to our environment? Are you willing to stop buying it? I hope that you rethink the use of plastic in your life and joing the movement this Earth Day. On a side note, I was sad to read yesterday that Barbara Bush, the former first lady and the mother of a president of the United States. I always admired her. In fact, I was lucky enough to have her give the commencement speech at my University when I received my Master's Degree. I cannot remember the entire speech, as it was years ago but I do remember that she spoke about the importance of family. She was a wonderful, fierce, loyal mother and very classy lady. I love that her platform was literacy and that she worked tirelessly her entire life for her causes. In fact she used to joke that she had never worked a day in her life so she could not understand why people wanted her to come and speak. How blessed her children, grandchildren and her husband were to have her. Rest in peace Barbara Bush. Good morning! How was your weekend? For many, including my family and a lot of friends in the Midwest it was another cold, wet, snowy weekend. My friend Anita of Castles, Crowns and Cottages said she got 2 FEET of snow. I hate to even write this but it was 85 here on Saturday and I got a sunburn while planting my containers. Sunday it was hot, humid and rainy but no snow. Since it was raining on Sunday I decided to use up some of the plethora of nuts, seeds and dried fruit that we have and make some granola. I make it to eat dry like a trail mix and as easy way to get my flax and chia seeds as well as healthy oats, nuts and fruit. But you can also sprinkle it on yogurt or eat it for breakfast with fresh fruit and milk. 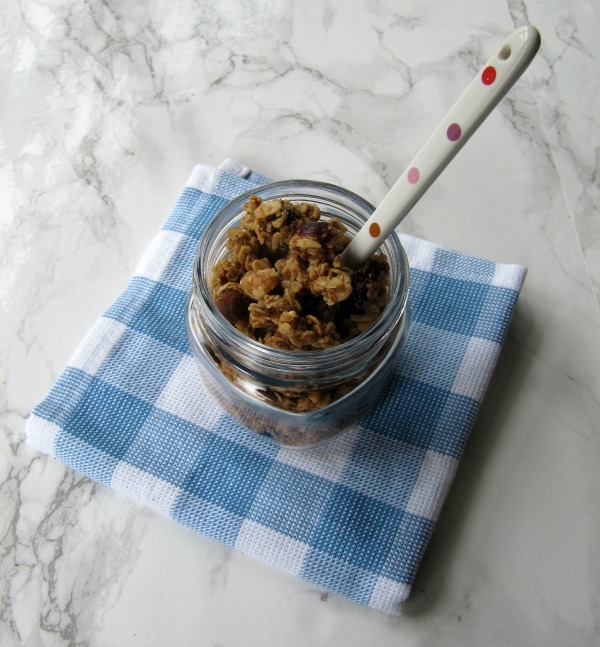 Combine the oats, almonds, walnuts, flax seeds, chia seeds, cinnamon and salt in a mixing bowl. 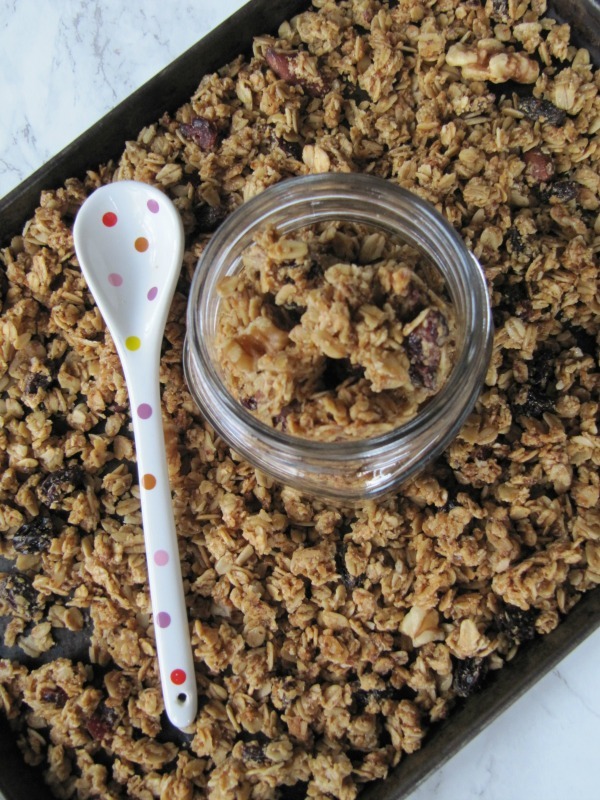 Stir in the dried fruit. Then stir in the coconut oil, honey, and the extract, mix well to coat. 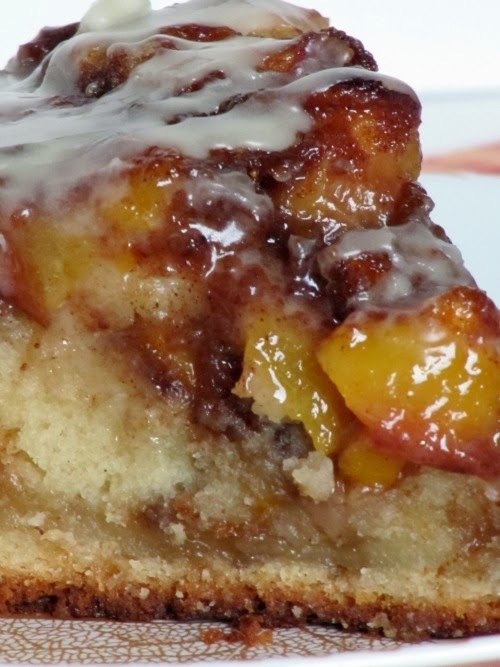 Spread the mixture evenly on a baking sheet lined with parchment paper. 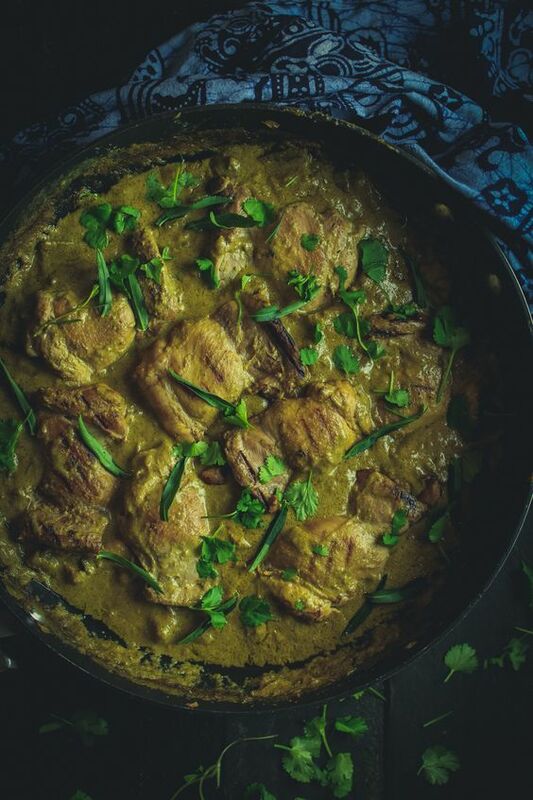 Bake at 300 for 15 minutes, then stir the mixture and rotate the pan, cook an additional 15 minutes, then sprinkle the coconut over the top and cook for an additional 5 minutes. Remove baking pan from oven and let cool. Enjoy. Good morning! I hope the weekend has started well, are you in the midst of a snowstorm? I don't want to rub it in but it is hot, it's going to be 80, although it is WINDY. That does make it hard to get my containers planted, as fast as I get the dirt in the container it is blowing around. And did I mention the pollen? I am not complaining I am trying to make you feel better if it is snowing and ugly by you. This week I discovered these gorgeous Royal Horticultural Society ceramic candles, not only are the containers beautiful but the scents sound fabulous. I ordered the lavender and the lily of the valley but I think any one of these would be perfect for a gift for yourself or a friend. I am off to get back to my plantings before the rain and heavier winds come. I hope that you have a fabulous day whatever the weather. P.S. The Royal Cultural Society has a beautiful website with tons of great information. Obviously I realize that some of the advice pertains to plants, conditions in the UK but it is still a great resource. Good morning! I hope that you had a good week. I cannot believe that there is a blizzard warning for this weekend for parts of the country, we are going to have severe winds, rain and flooding. Fasten your seat belts people, it's going to be a bumpy ride. 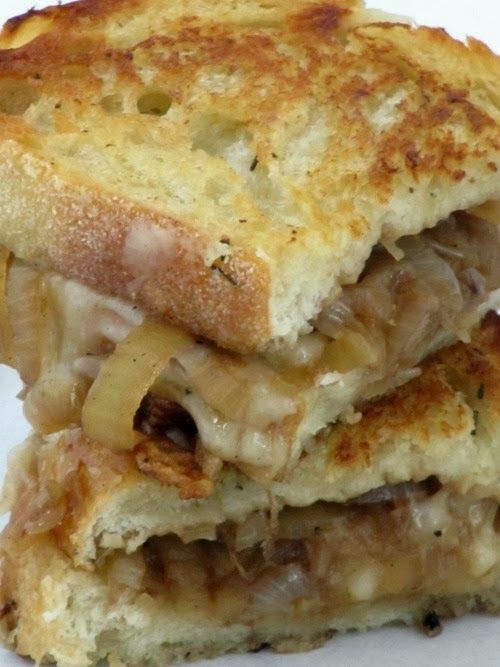 Yesterday was National Grilled Cheese day, and this French Onion Grilled Cheese Sandwich is one of my favorites. 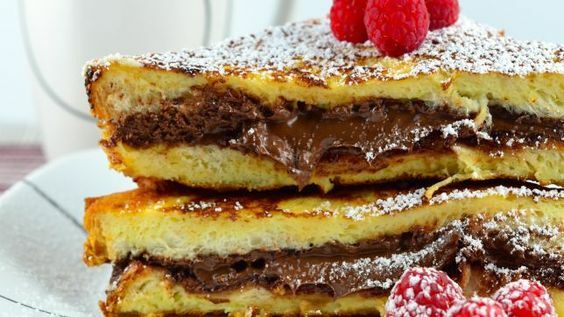 If you like Nutella then you will want to check out this post of 26 Easy Nutella Recipes from Genius Kitchen. 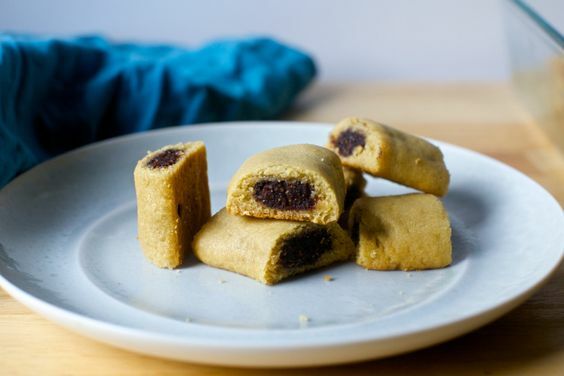 I love fig newtons and this homemade version from Smitten Kitchen is on my list to make. Lately there seems to be articles everywhere about "self-care", getting massages, taking time for yourself, bubble baths, etc. 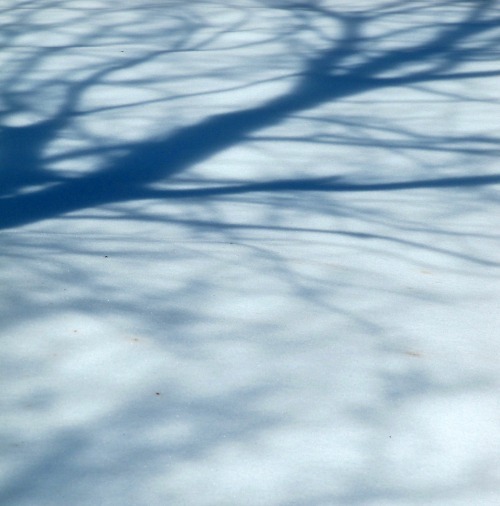 I like this post from The Drifter Collective, How to Add Compassion to Your Self Care Routine. You have to watch this video, How the Worst Moments in Our Lives Make Us Who We Are. 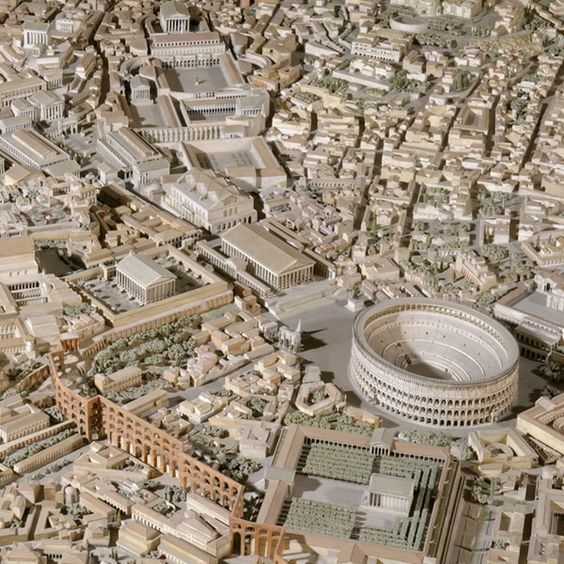 Wow: Archeologist Spends 35 Years Building Model of Ancient Rome. Have you seen the movie Jungle? I watched it this week and it was interesting. That's it for this week. 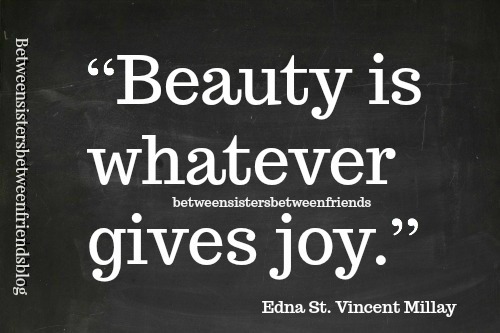 I hope that you share whatever recipes, books, movies or article you found this week. Stay safe in the crazy weather and enjoy your weekend. Good morning. It's a beautiful day, not only because the weather is nice but because its Thursday, just one more day to the weekend. I have a super busy day today but I wanted to share these "cute critters" from Wrendale Designs UK. These adorable animals are the work of award winning artist Hannah Dale and for the next 3 days they are on sale at Zulily. I love the little duck and the hare. 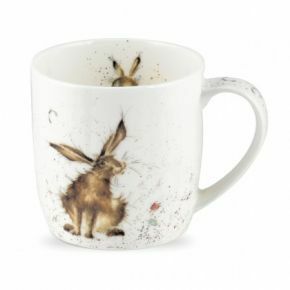 Any one of these pieces could add a touch of whimsy to your home. I ordered the apron for myself and one of the mugs as a gift. There are also utensils, candles and more. Obviously the entire line of pillows, tins, stationary and more are not at Zulily but you could always check out the website of Wrendale Designs for more items. Spring arrived officially a couple of weeks ago and aside from the budding trees and bright daffodils you would not know it. The roller-coaster weather has made me stop and enjoy each sunny, warm day. 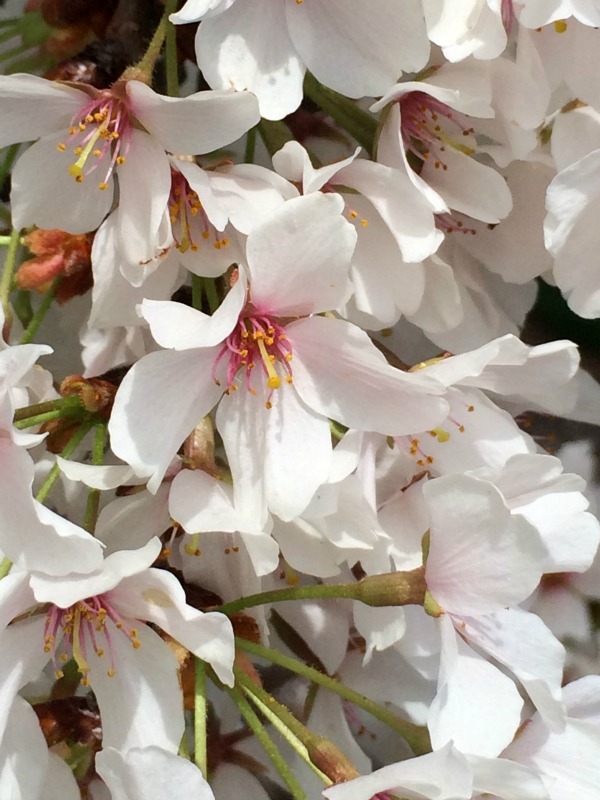 On the days that it is warm and dry enough for a walk I find myself stopping to take in the the changes that sprout seemingly overnight, the variegated patterns of pink blossoms on the cherry trees, the brightly colored tulips in my neighbors yard, first the purple and now the pinks, the forlicking baby bunnies and the plethora of birds at my feeder. This morning I noticed the smooth beauty of the crepe myrtle tree trunks with the piles of bark littering the ground around them like curls of chocolate. Rather than complaining each morning about the cold and the damp I come home from yoga excited to sit another day for a bit before the fire with my pups, enjoying a cup of cocoa while checking my email. I relish these days as soon it will be hot and humid and I will be wishing for the cool crisp air of Fall. This past week my family lost a good friend of over 20 years, my husbands' coworker lost his battle with ALS and my 90 year old father in law lost his balance and fell through the glass shower. Thankfully he was not hurt too badly but each of these tragedies has caused me to pause and to take stock of life. 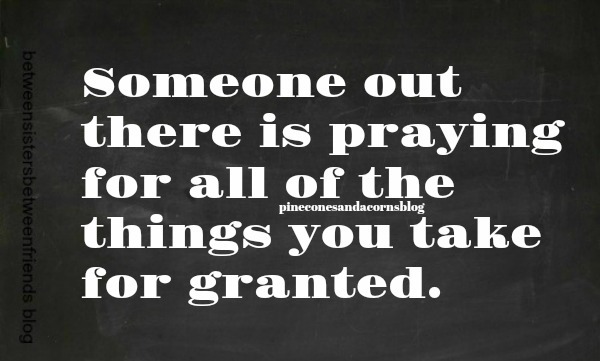 I thank God each night for my health, my husband and my pups and that of my family and friends. Life is precious and we need to take the time to enjoy our family and friends and to tell them how much we love them. These are the little things, some good, some sad this month. I hope that you take a minute to note the little things in your life, after all it is what life is all about. 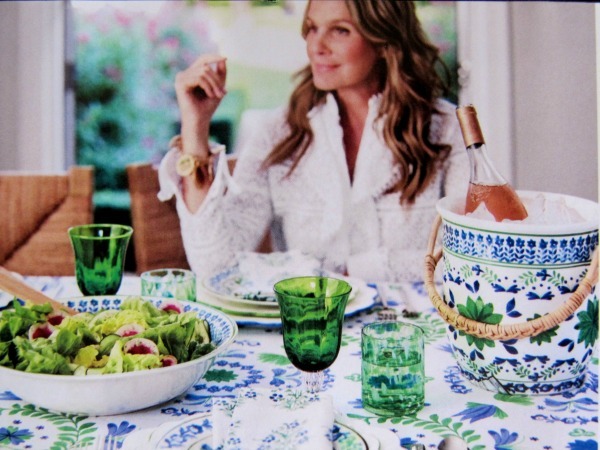 I recently received a Williams Sonoma catalog in the mail and I fell in love with the new Aerin Collection. 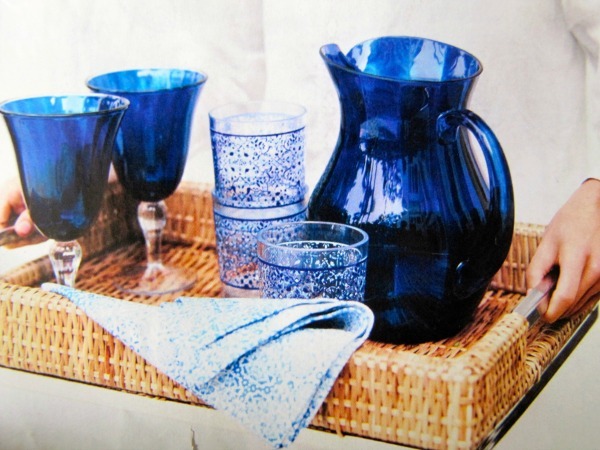 The blue and green is such a classic color combination and would look fabulous on your summer table. I love the green wine glasses and the confetti old fashioned glasses, they would be great for cocktails on the porch. The champagne bucket with the woven handle is one of my favorite pieces in the collection. 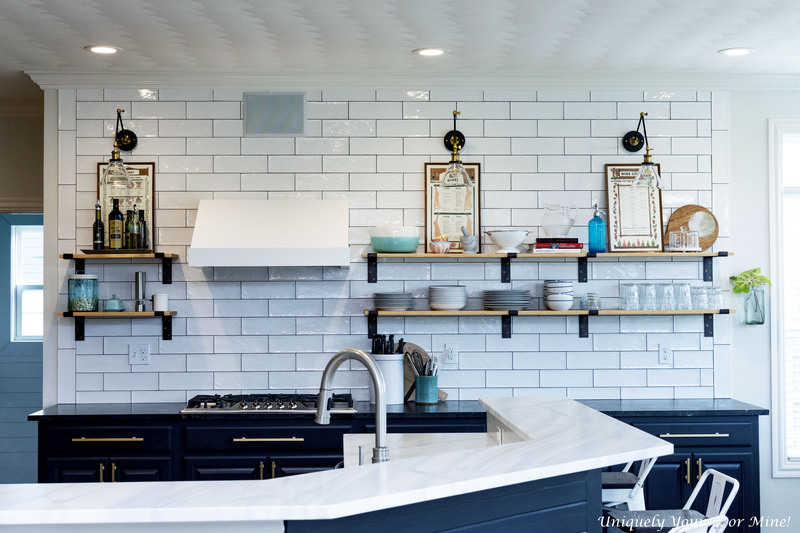 I also LOVE, yes LOVE the scalloped dinner plates with the blue trim. I ordered them to use with all of the blue and white transfer ware that I have. I think it will look beautiful. 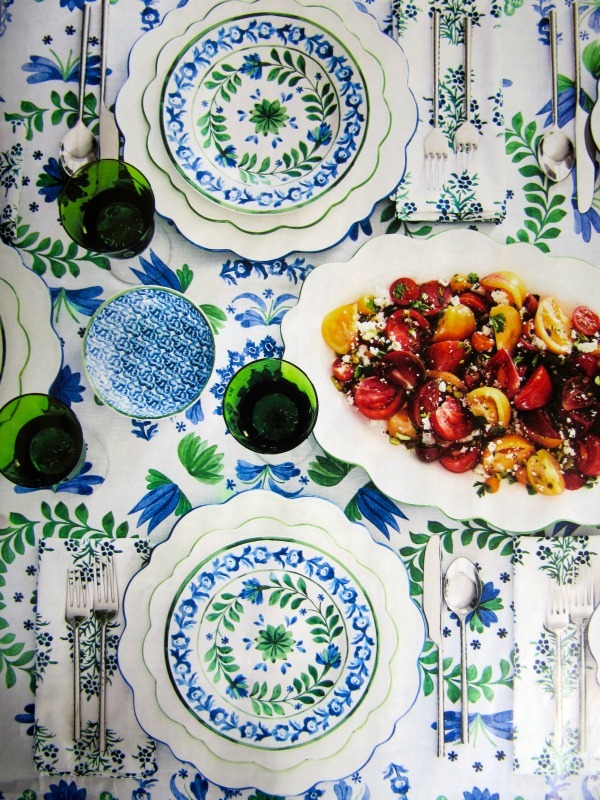 I am torn as to whether or not I need the scalloped salad plates with the green trim, decisions, decisions. 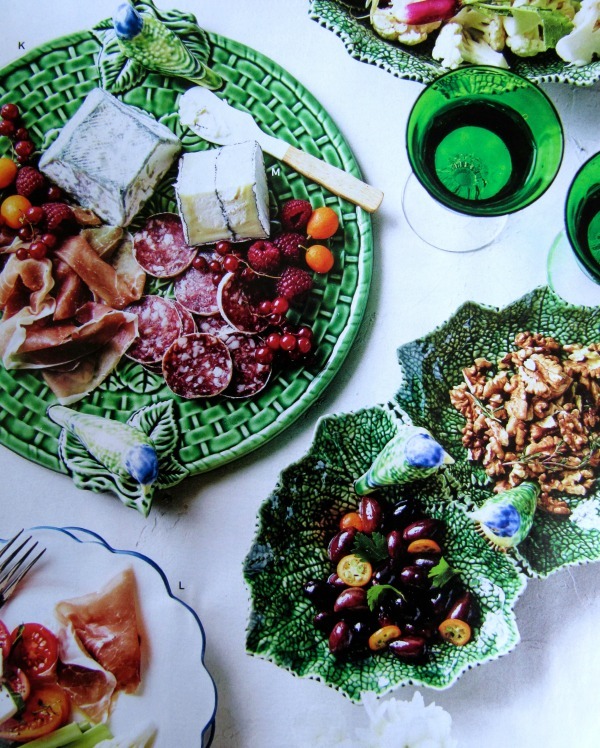 I think the serving pieces are versatile and would be a great addition to both your everyday and party tables. You could use the beautiful green pieces at the holidays too! 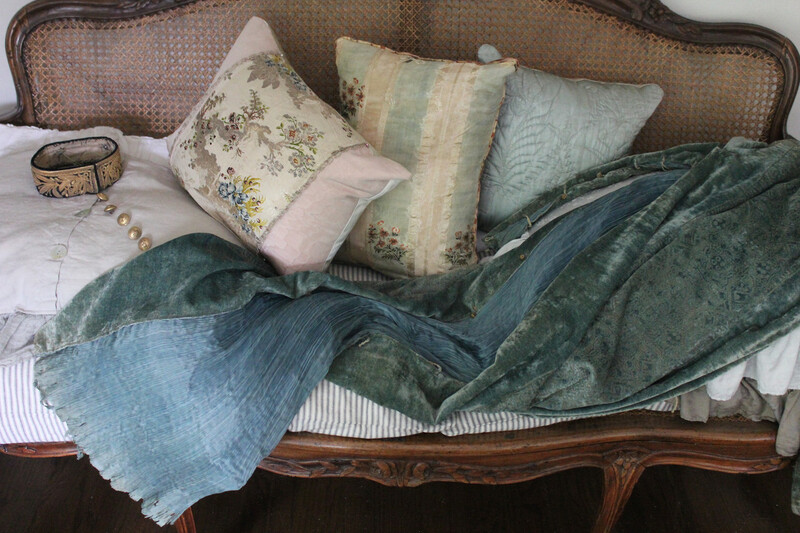 These are just a few of the beautiful pieces available, there are also pillows, outdoor furniture, bedding and more. Each piece is classic and something that you will enjoy for years. If you would like to see more of the Aerin collection at Williams Sonoma I put together a collage of a few of my favorite pieces below. Good morning! I hope this Friday morning finds you enjoying a little bit of Spring and not in the midst of yet another snow storm, hail storm, tornado warning or cold day. There was mention here of a little snow but sadly that is not going to happen, we are going to get lots of rain. That is not going to dampen my spirits because I will be at the nursery getting my plants and flowers for my summer containers. 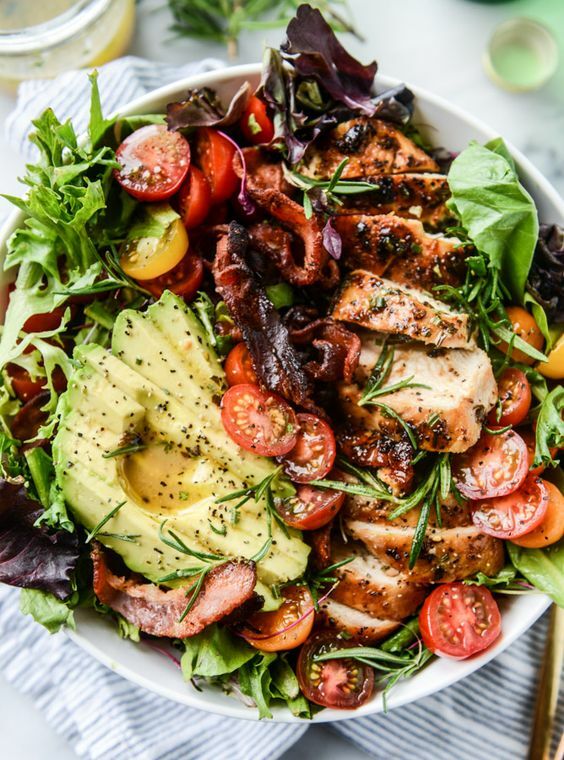 As much as I would love to continue to eat pasta and pizza my winter comfort food I need to start eating a few more salads and this Rosemary Chicken Avocado Salad from How Sweet Eats. 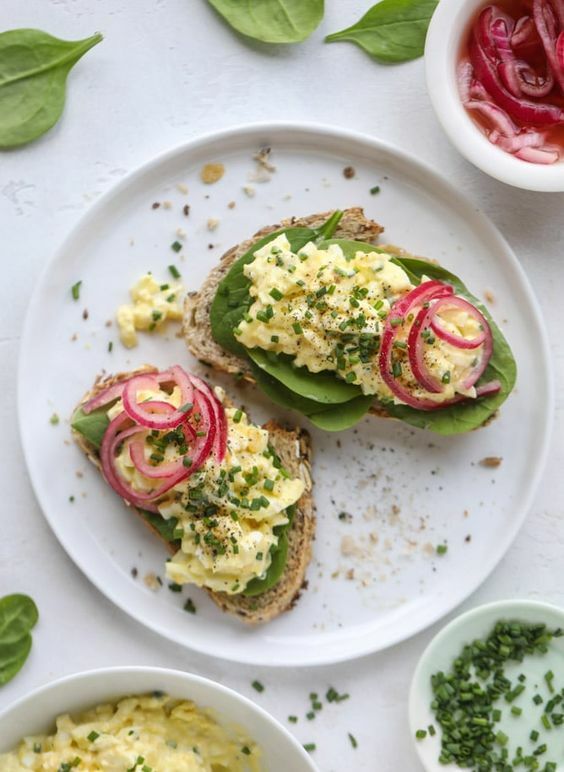 If you still have hard boiled eggs left you could make this scrumptious Egg Salad Sandwich, I think I might make this for lunch. 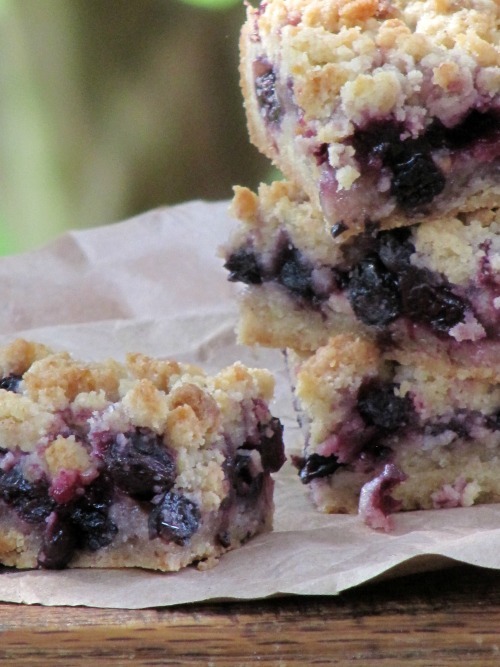 Spring and summer are all about fruit desserts and I think these Blueberry Cheesecake Bars are the perfect dessert to make to usher in warmer weather. 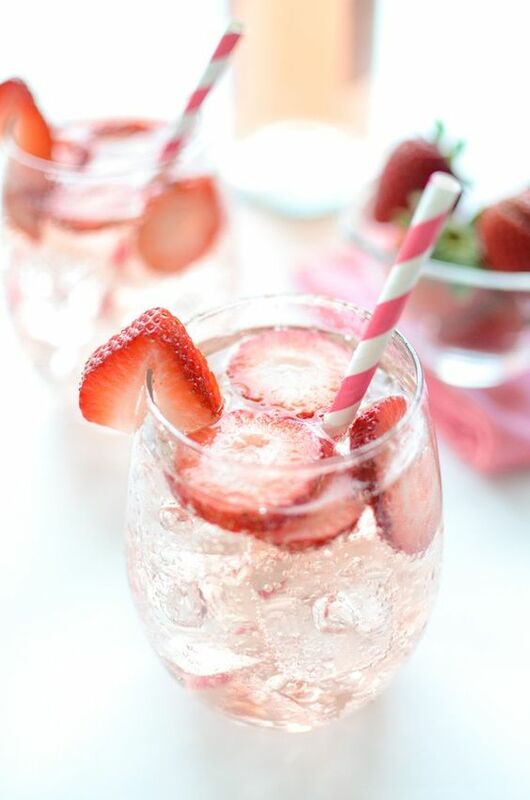 Bookmark this Pink Strawberry Sangria from Simply Whisked for warmer days ahead. 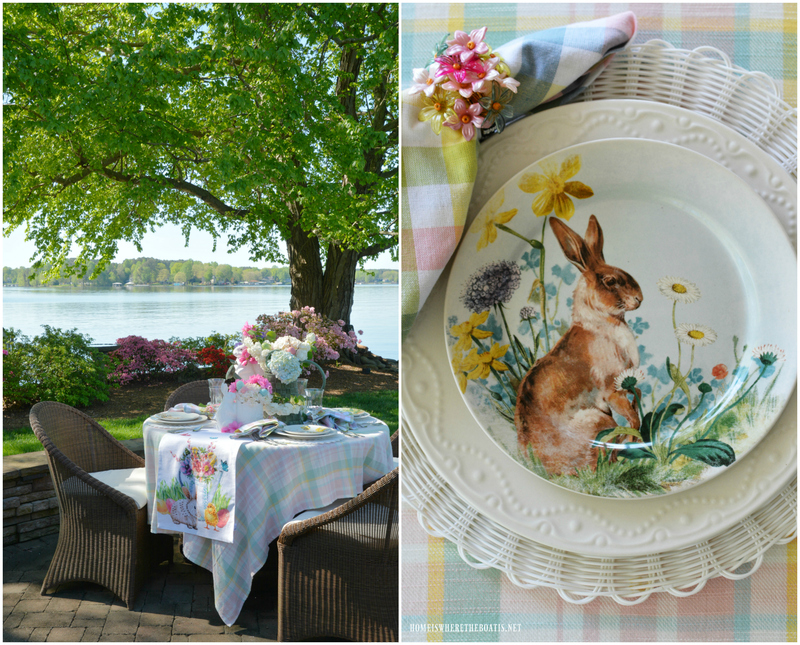 If you would like a few brunch ideas for Spring check out this post from What's Gabby Cooking. I have been lucky enough to see the Sistine Chapel painted by Michelangelo at the Vatican Museum in Rome. But unfortunately it is always crowded when you are there so it is hard to take it all in. 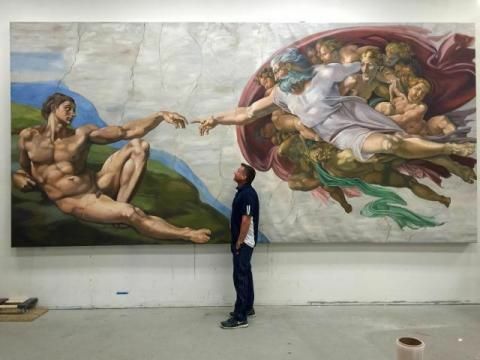 I am hoping that someday soon the Martin Biallis Sistine Chapel exhibit will be in my area. If you are a lover of British history, specifically Georgina Cavendish the Duchess of Devonshire or a lover of Mr. Darcy from Pride and Prejudice than you may be interested to know that the 50 Million dollar/ 10 Year renovation of Chatsworth House is complete. Now you can see the 500 year old house in all of its splendor. 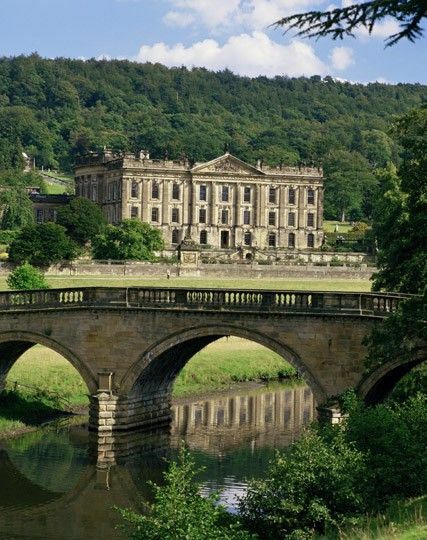 By the way Chatsworth House played the part of Mr. Darcy's house in Pride and Prejudice. Love this article, 22Ambassadors Recommend the One Book To read Before Visiting Their Country. 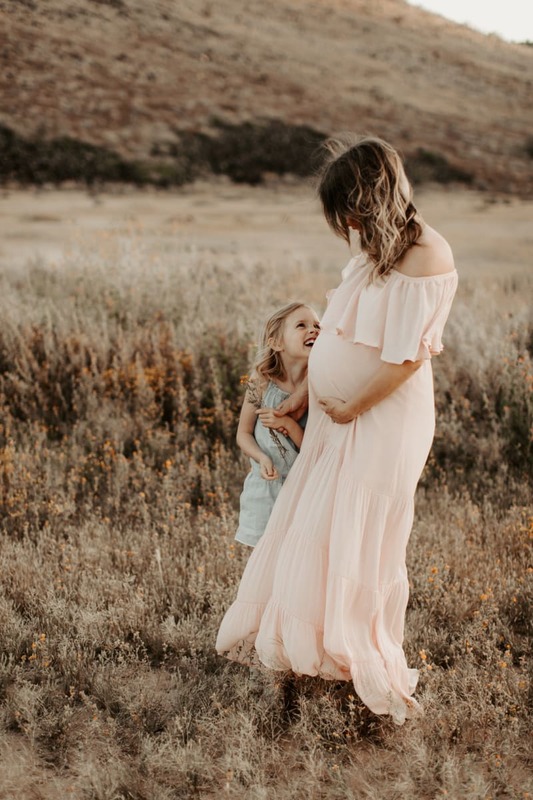 Although I do not consider myself a fashionista I love to see women who are and Advanced Style is one of my favorite places to discover beautiful women of advanced years. I hope that as I age I can age as gracefully and as fashionable as these women. This weeks post A Letter from Dee touched me and I think it will you as well. That is it for this week. I hope that you will share any of your finds from the week. Have a wonderful and safe weekend.